Thomas Riemer entered the glove business in his early 20s to work alongside his father, Erwin Riemer, co-owner of the Austrian glove brand RIKA. Riemer senior and his partner had founded RIKA in the ‘60s and were producing both fashion and sports gloves, in their workshops in Austria and Hungary. However, the innovations introduced in the making of the sports gloves brought RIKA unexpected fame in 1964 when Austria hosted the IXth Olympic Winter Games in Innsbruck and the company became the official glove outfitter of the olympic national skiing teams of Austria, Switzerland and Lichtenstein. 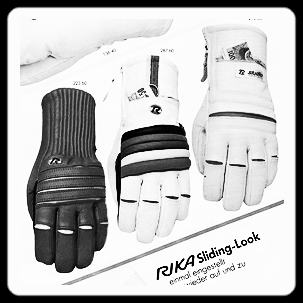 The knuckle fold that brought increased comfort, the so-called sauna-glove with a closing flap to prevent the cold air from coming in, but also the modern design and the bright rainbow colours helped establish the RIKA glove brand in the winter sports world and fuelled its success. Over the years, RIKA supplied gloves also to the Spanish Riding School in Vienna, to the Austrian police and other authorities. Riemer senior collaborated with traditional costumes producer Giesswein and sold his gloves at Saks 5th Avenue in New York and Harrods in London. But when Erwin passed away in 2001, RIKA ceased its business, and his son Thomas, who had been the sales director for Europe, stepped away from the glove industry. Six years later, the owners of the oldest Viennese glove shop, on the brink of retirement, approached Riemer junior and asked him if he wants to take over their business. 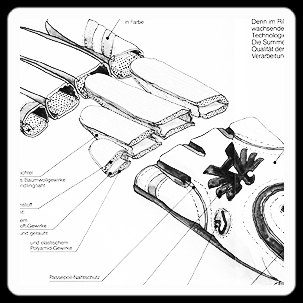 The Austrian glove makers had become extinct, as was the case with many other crafts in developed countries, and most of the people who had the knowledge and the workmanship were also gone. For the owners of the Viennese glove shop founded in 1845, Thomas Riemer was the only young man they knew who had the know-how to carry on their family’s tradition. As the new owner of the oldest glove shop in Vienna, the young Riemer experienced first-hand servicing customers and soon came to realise that the gloves made by French or Italian manufacturers that he was selling in his shop weren’t fitting his Austrian, German or Swiss customers. At least not how he knew from his father that gloves should fit. With his father’s old street gloves patterns, Riemer decided to go to Hungary, in search of the old manufacturers and craftsmen. Some of them were retired but had plenty of time on their hands and the will to work again. The gloves, initially manufactured in Hungarian factories, were so successful that other shops in Vienna asked Thomas Riemer to supply them. In 2009, Riemer decided to open his own workshop in Hungary and rented a 50 square metres space in an industrial building. He hired two men, experienced glove cutters, and five women highly skilled in glove making. From two old Hungarian factories who had stopped their production, he bought three old sewing machines. For the hand sewn gloves, he found seamstresses who used to work with his father, now well over 60 or even 70 years old, and who work from home. Riemer himself took charge of researching and resourcing materials and of marketing and selling the gloves made under his own brand, TR Handschuhe Wien. The same year, the Spanish Riding School in Vienna approached Riemer and asked him if he could continue his father’s tradition and manufacture the gloves for the riders. Made in doeskin, these unlined gloves feature a special knot-stitch seam which is considered by the glover’s guild an art in itself. But the machines, which practically make a knot after easch stitch, had been built for the army industry in Germany, before the first world war, and have since disappeared. From an old workshop, Riemer managed to buy the last and only such machine that still existed in Austria. And thus he became the exclusive glove manufacturer of the traditional natural colour doeskin gloves of the Spanish Riding School in Vienna. Within only a few years, the name Riemer became once again known in the glove industry and the TR gloves found their way into prestigious gentlemen's and ladies' boutiques and department stores in Europe and beyond. Currently, Thomas Riemer’s handmade street gloves are being retailed in more than 150 shops in a dozen countries, including the United States, Canada, Russia, Japan and South Korea. There is nothing modern in the way the Thomas Riemer gloves are made: his father’s patterns for dress gloves developed in the ’60, old sewing machines, even century-old, and tools of the trade, old techniques and the skills of elderly craftsmen who have been making gloves since more than 40 years. The leathers are carefully selected and resourced from some of the best Austrian, German, Finnish, French or Swiss tanneries. With one Austrian tanner, Thomas Riemer worked for three years to develop a special goatskin which has one colour on the upper side and another colour on the reverse side. Gloves manufactured in this two-tone goatskin, sewn by hand, sometimes with multicolour threads, have now become one of the Thomas Riemer signature gloves. In Hungary, the cutters are preparing each leather skin by soaking it overnight and then stretching it. A well fitting glove must have the right length and the right tightness. When worn, it should stretch little and only in width and it should mould in time after the wearer’s hands. Only a very experienced glove cutter, who cuts the leather by hand, can judge its character and decide how much to soak and stretch it and in what direction to cut it to aim for perfection. After the cutter makes the rough cut with the scissors, he signs the leather and makes then the precise cut using the steel knives corresponding to each pattern. The seamstress fits all pieces and sews them together with a sewing machine. If the gloves are lined, the lining is inserted into each glove and sewn at the fingertips and at the wrist edge. When ready, the gloves are ironed, for the last finishing touch. The hand sewn gloves are made in the same way, with one exception. After cutting, the fitted pieces go to one of the dozen seamstresses who work from home. They are the ones with the 'golden hands' that can stitch leather with outstanding mastery and precision and without any prior signing or piercing to guide their stitches. Such an experienced seamstress can make only three pairs of entirely hand sewn gloves a day.